The earlier a mold problem is spotted and removed, the better. The nature of mold allows it to grow on and spread to virtually any surface. Unaddressed mold problems will only grow to be worse with time. If you neglect the water source promoting the mold contamination, over time it will diminish the structural integrity of the building. Prolonged exposure to mold can also be toxic to some individuals. If you are concerned about potential mold development in your North Hanover, NJ home, call a mold removal professional in New Jersey to promptly diagnose and address the problem. Mold is considered a bio-contaminant that requires, in most cases, professional attention. 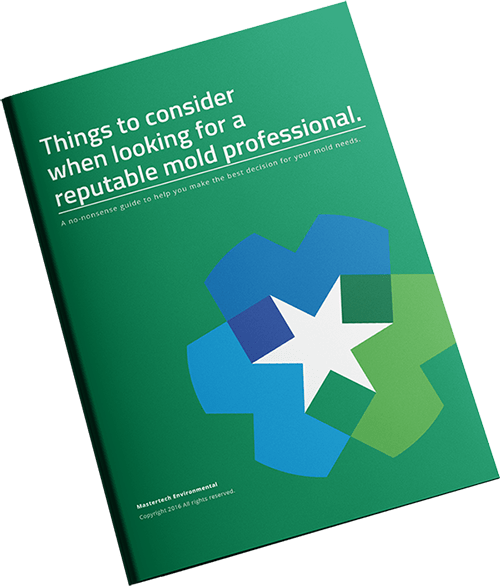 A certified mold professional will have the necessary training, knowledge, and tools to properly diagnose the problem and prescribe an appropriate solution to the problem. If there are signs pointing to a potential mold contamination in your home or business, you may need a professional mold inspection in North Hanover, NJ. A certified mold inspector will be able to accurately assess your property for mold. Once your MasterTech inspection completes a full inspection of the property, he or she will present you with a clear and concise report of findings. The report will outline what we did, what we found, where we found it and what to do next. If mold remediation is within your requirements, MasterTech will draft a scope of work for mold removal in North Hanover, NJ. Every mold contamination will be a little different, depending on various factors and conditions. Your scope of work will be tailor-made for your specific mold removal and mold preventative needs. The MasterTech Team has developed a mold remediation process that promises the safest, most efficient, and most effective mold remediation that addresses: causation, containment, and cleaning & disposal. MasterTech’s top priority will always be safety and quality control. From your very first phone call or email to the last step of mold remediation and final recommendations, we will keep you and your family’s safety and best interest in mind. We take time to stress to every Mastertech employee that doing the job right the first time is not our goal – it is our standard. Every MasterTech employee is carefully trained and equipped with the necessary skills, knowledge, and tools to provide the safest and most effective mold remediation in North Hanover, NJ. The first sign of water intrusion is usually water staining or efflorescence. Efflorescence is the white, powdery substance that develops on the foundation wall surface. It is the result of water or vapor seepage which forces soluble salts and minerals to the surface. While efflorescence is not mold, but it is a sign of water or moisture seepage which can cause mold. If you are detecting signs of mold growth or if your North Hanover, NJ basement has a history of moisture problems, you should contact a certified professional to have your basement inspected. Most crawl spaces contain perfect conditions to support mold growth. Porous building materials and poor building envelope design play a huge role in most crawl space mold in North Hanover, NJ. Many crawl spaces are poorly vented with undersized wall vents. Although this seemed like a great idea years ago when they were introduced and added to the construction code, they have made moisture and mold issues worse. In spring and summer, crawl space vents introduce warm air into cool crawl spaces causing condensation on wood and masonry building materials. The same effect happens during cold seasons – only in the opposite order. The combination of heat and poor ventilation can cause North Hanover, NJ attic mold. If not properly ventilated, moist air gets trapped and infuses itself into the attic sheathing and rafters. This moist air can also increase airborne mold spore levels which can settle into insulation and on belongings stored in your attic. Proper mold remediation techniques are important to ensure that attic mold doesn’t cross-contaminate the inhabitable areas below during cleanup. Our process also minimizes or eliminates dark staining left behind by moisture. Are looking for a mold expert that you can trust in New Jersey? MasterTech has helped NJ famlies through home and business mold contaminations for years. Call us today to learn more about mold removal in Burlington County, NJ. If you are looking for mold inspection and mold removal in Florence, NJ or mold inspection and mold removal in Palmyra, NJ, Mastertech can help!